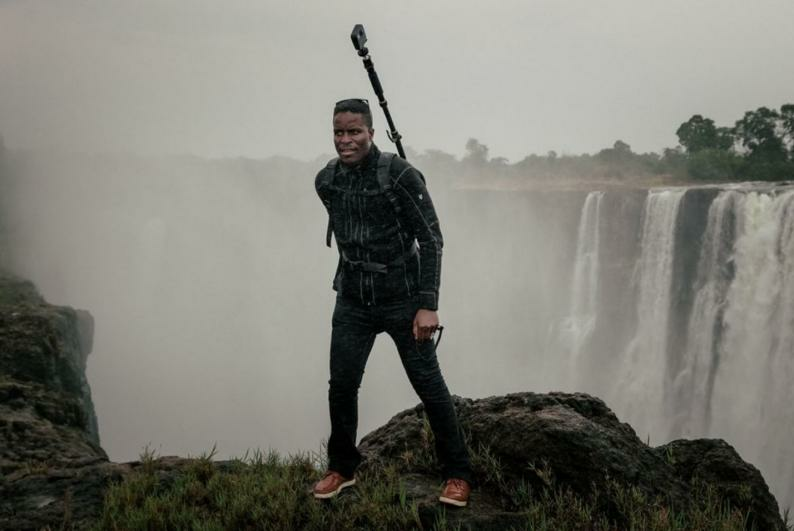 Kanhema, who left the country to study journalism and documentary film-making at the University of California, Berkeley, spent two weeks back in Zimbabwe shooting the sights and sounds of the coolest places. Areas he covered include the capital's Harare's central business districts, malls, a virtual tour of Victoria Falls, Christmas Pass, the city of Mutare's main business strip as well as the Great Zimbabwe monument and the Eastern Highlands. He's uploaded over 500 miles of coverage, including Street View images uploaded during October and November. It's a lot to pack in, especially over a mere two weeks, but Kanhema got it done with a custom off-the-shelf kit of cameras consisting of the Insta360 Pro 2 and a GoPro Fusion. He particularly liked the Pro 2, which is Street View ready -- meaning he could publish footage to the platform right after shooting it. CNET spoke to Kanhema to find out more. So tell me more about you and why you decided to embark on such a project. I grew up in Zimbabwe and went to school at the University of California, Berkeley where I studied journalism and documentary film-making. I currently work as a product manager in San Francisco, building news applications and internal tools for newsrooms. I have a background in journalism and documentary photography, so visual storytelling has always been close to my heart and I see a lot of opportunities for storytelling on the Street View platform. I started experimenting with WebVR and WebGL frameworks back back in 2015, developing ways for journalists to create immersive stories using spherical photos and video and figuring out ways to make them easily accessible to users on desktop and mobile as well as in VR headsets. I started shooting 360 video and photography and developed an interest in testing the different camera platforms as the market rapidly expanded. In 2016, I got involved with Google's user generated content initiative, the Street View Camera Loan Program, which allows photographers to borrow a Street View ready camera and take it somewhere interesting. I then pitched two UNESCO World Heritage Sites, Victoria Falls in Zimbabwe and Stone Town in Zanzibar as ideal pilots for expanding Street View to new markets in southern Africa, a region that is still underrepresented and mostly missing from Street View. Did Google help you with the expenses? 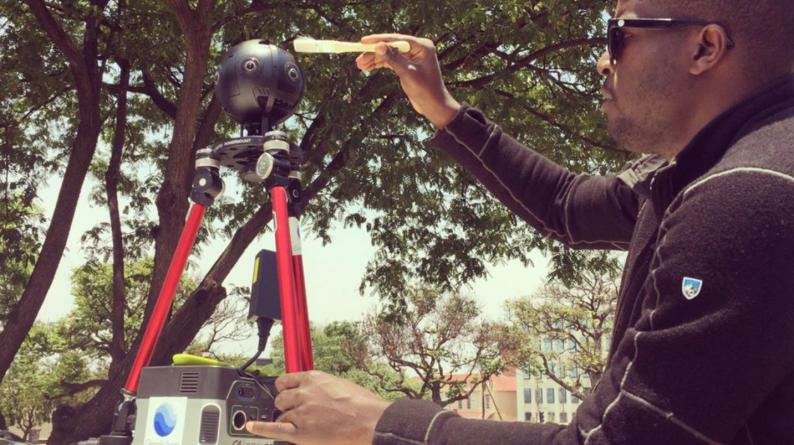 I personally funded all travel and production costs related to the Zimbabwe Street View project. Google and Insta360 provided the Insta360 Pro 2 through the camera loan program. The Insta360 Pro 2 had only been on the market for a week when we began the project, so this was more or less a field test for the camera's new hardware, new features and some revised post-production workflows. How much did you spend on the project? Photography is not cheap hobby, and this is something I wanted to spend a bit more on to produce quality content. It is my home country after all. Preparing the Insta360 Pro 2 for shooting. What was your gear setup like? For this project, I tested about half a dozen camera platforms and built a Street View mapping kit that consists of a combination of off-the-shelf products. My current gear setup consists of two cameras, an Insta360 Pro 2 and a GoPro Fusion. The Insta360 Pro 2 is 'Street View ready' meaning publishing is fully supported on the platform using a desktop application, while publishing footage from the GoPro Fusion currently requires the use of a Python script. In cities and densely populated areas, our primary set-up was car mounted, and we also used this on a speed boat and an ATV. For the Insta360 Pro 2, it shot stills at 12K and video at 8K, with a desktop application for stitching, editing and publishing to Street View. The process is mostly seamless. Driving speed is limited to 37 mph (59 kmh) for the Insta360. Anything faster than that introduces blur to the images. The cameras were mounted using a CamTree Power Grip suction rig with a bowl head mount. How did you manage to get battery and power for the whole setup? The Insta360 Pro2 ships with a battery that has an endurance of 50 minutes (setting up can take anywhere from two minutes to 15 minutes, leaving only 40 minutes of production), so we used a GOAL Zero UPS Battery Pack mounted to the car. This extended operation time to up to 6 hours, allowing us to do longer drives, as well as the river mapping by speed boat. You mentioned river mapping by speed boat, what's that like? Mapping the Zambezi river was probably my favorite part of this project. It's a very unique way of experiencing the Zambezi Valley's rich biodiversity. We arrived in Victoria Falls late afternoon, just in time to catch the sunset on the Zambezi river. We mounted the Insta360 Pro 2 to the bow of a speedboat and sailed about a mile down the river. We had a couple of wildlife sightings, an elephant a few hundred feet on the riverbank to the Zambian side of the Zambezi and a crash of hippos further upstream. You should be able to see these images on Street View. 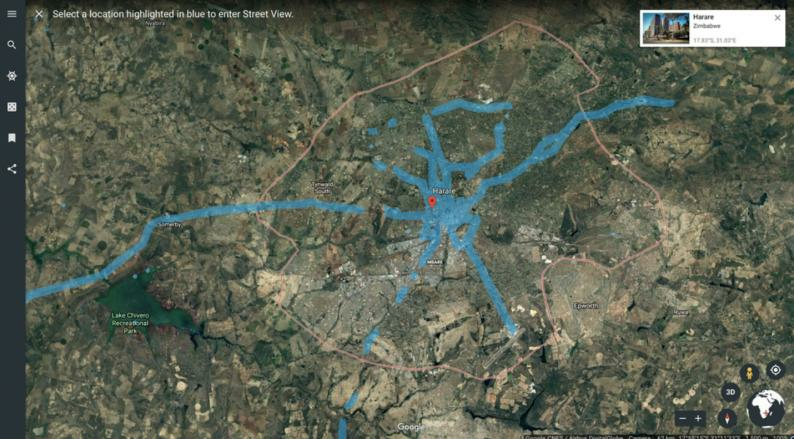 Areas in blue indicate locations that are Street View ready. How long did you take for the project? This phase of the project took just two weeks, that's ten days of driving about 8 hours a day, with two days of media management and two days of travel. You accumulate so much data you don't want to do anything longer than ten days at a time before processing and publishing some test images. Did you manage to get everything you needed? 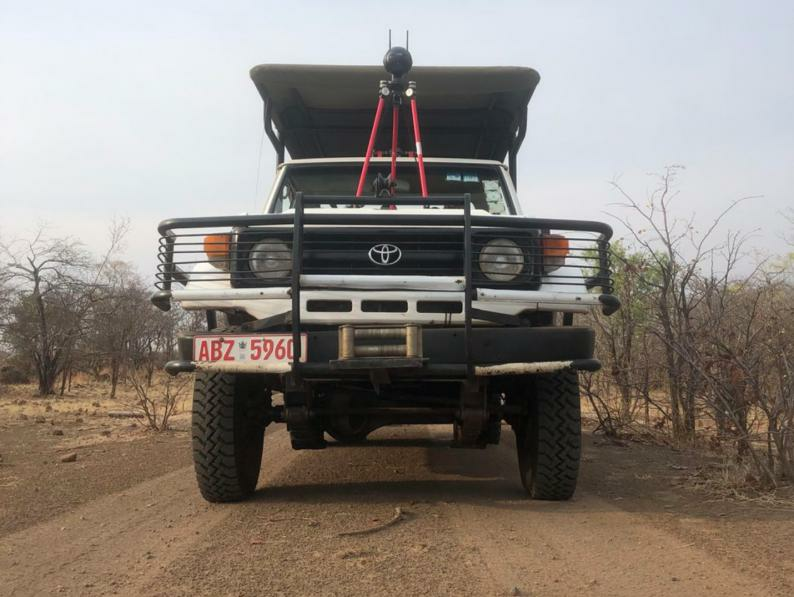 I was able to get the most important parts but I was thinking of this more as a snapshot of Zimbabwe on Street View, capturing all of the key places of interest while testing the cameras and getting more familiar with the production environment. What was the most challenging thing about your adventure? Testing new camera hardware sounds fun, but it's really challenging when you do it at 37 mph on the highway, in city traffic or on a speedboat. In addition to juggling a dozen other variables, everything is moving so fast, and you can only be in certain places once, so you have to get it right the first time. Mapping some of Zimbabwe's key attractions and cities over those two weeks was like rediscovering the country allover again. It was quite nostalgic walking down the street on which I grew up on and quite emotional seeing how much has changed over the years. I'm glad to be able to capture a snapshot that will allow us to look back and see where the cities go from here. I get emails from Zimbabweans abroad who want to show their kids the streets they grew up on on Street View and I realize that there are not many ways to preserve those memories and the visual ethnography of a city. The Insta360 Pro 2 mounted on an ATV. Where else would you take this project to? We'll be mapping Zanzibar next. We're currently working on a timeline to map Stone Town in Zanzibar and other towns and attractions on the Island. Stay tuned! I can really feel your passion and enthusiasm, was this something of a give back to Zimbabwe? I'm keen to contribute to ongoing efforts to accelerate the pace of technology transfer and showcase some of the key attractions in the region while also giving others the opportunity to see what life is like in different parts of the country. Improving maps is key to unlocking opportunities, not just for local businesses, but also for local governments. There are multiple potential applications of GIS data, from infrastructure planning and maintenance, enhancing road traffic safety, to environmental monitoring for conservation and epidemiology research, among others. Lastly, you mentioned it was challenging to get it right the first time, did you have to do any redos? A typical production day consists of many moving parts, so redos are inevitable and sometimes necessary. Abrupt changes in lighting and weather conditions mean you have to constantly monitor the camera to ensure consistent image quality and uninterrupted, continuous GPS coverage. Driving in downtown areas often presents the challenge of dense foliage and concrete overpasses that may interrupt GPS coverage, so redoing certain sections helps improve accuracy and correct for any GPS drift. We only had 10 days, and I'm happy with the work we were able to accomplish in such a short amount of time.